Gorgeous yellow and sky blue color combination beach dress has a keyhole on neckline and asymmetrical hemline. 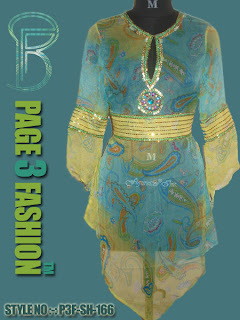 It has elegant hand embroidery of beads and sequins on neckline, waistline and sleeves. It is perfectly ideal to a wearer for any beach. •	Prepared from fine Polyester fabric. •	Fabulous paisley print and embroidery. •	An elegant beach dress is a model outfit for any beach.